The main conclusion of the 70-page report — the White House gave me an advance draft — is that the Recovery Act increased U.S. GDP by roughly 2 to 2.5 percentage points from late 2009 through mid-2011, keeping us out of a double-dip recession. It added about 6 million “job years” (a full-time job for a full year) through the end of 2012. If you combine the Recovery Act with a series of follow-up measures, including unemployment-insurance extensions, small-business tax cuts and payroll tax cuts, the Administration’s fiscal stimulus produced a 2% to 3% increase in GDP in every quarter from late 2009 through 2012, and 9 million extra job years, according to the report. The White House, of course, is not an objective source — Council of Economic Advisers chair Jason Furman, who oversaw the report, helped assemble the Recovery Act — but its estimates are in line with work by the nonpartisan Congressional Budget Office and a variety of private-sector analysts. Before Obama took office, it would have been a truism to assert that stimulus packages stimulate the economy: every 2008 presidential candidate proposed a stimulus, and Mitt Romney’s proposal was the most aggressive. In January 2009, House Republicans (including Paul Ryan) voted for a $715 billion stimulus bill that was almost as expansive as Obama’s. But even though the stimulus has been a partisan political football for the past five years, that truism still holds. The report also estimates that the Recovery Act’s aid to victims of the Great Recession — in the form of expanded food stamps, earned-income tax credits, unemployment benefits and much more — directly prevented 5.3 million people from slipping below the poverty line. It also improved nearly 42,000 miles of roads, repaired over 2,700 bridges, funded 12,220 transit vehicles, improved more than 3,000 water projects and provided tax cuts to 160 million American workers. My obsession with the stimulus has focused less on its short-term economic jolt than its long-term policy revolution: I wrote an article about it for TIME titled “How the Stimulus Is Changing America” and a book about it called The New New Deal. The Recovery Act jump-started clean energy in America, financing unprecedented investments in wind, solar, geothermal and other renewable sources of electricity. It advanced biofuels, electric vehicles and energy efficiency in every imaginable form. It helped fund the factories to build all that green stuff in the U.S., and research into the green technologies of tomorrow. It’s the reason U.S. wind production has increased 145% since 2008 and solar installations have increased more than 1,200%. The stimulus is also the reason the use of electronic medical records has more than doubled in doctors’ offices and almost quintupled in hospitals. It improved more than 110,000 miles of broadband infrastructure. It launched Race to the Top, the most ambitious national education reform in decades. At a ceremony Thursday in the Mojave Desert, Energy Secretary Ernest Moniz dedicated the world’s largest solar plant, a billion-dollar stimulus project funded by the same loan program that financed the notorious Solyndra factory. It will be providing clean energy to 94,000 homes long after Solyndra has been forgotten. Unfortunately, the only long-term effect of the Recovery Act that’s gotten much attention has been its long-term effect on national deficits and debts. As the White House report makes clear, that effect is negligible. The overwhelming majority of the Recovery Act’s dollars have gone out the door; it’s no longer adding to the deficit. It did add about 0.1% to our 75-year debt projections, but allowing the economy to slip into a depression would have added a lot more debt. Grunwald did warn of the political ramifications. As conservatives have convinced themselves that economic stimulus doesn’t work as a knee jerk reaction to anything proposed by Obama, politicians are likely to shy away from stimulus when needed in the future, following the European mistakes in promoting austerity. Such views in this country already led to the stimulus being significantly smaller than it should have been, especially in light of continuing problems with unemployment. 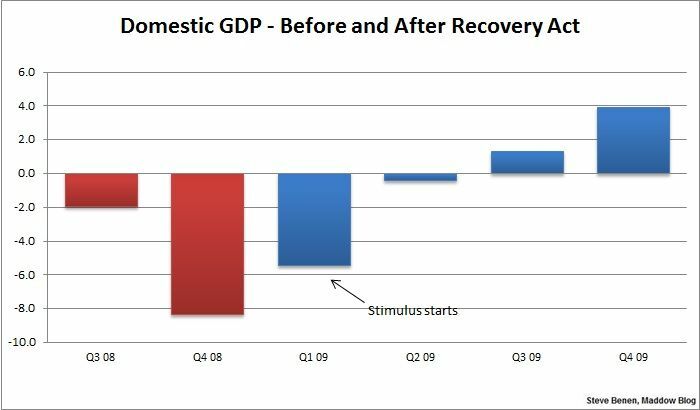 Steve Benen has more facts and tables on the benefits of the stimulus, such as the table above on the effect of the stimulus on GDP. Think Progress cited several Republicans who attacked Obama on the stimulus and then took credit for its benefits. Posted in Barack Obama, Economy, Education, Health Care, Mitt Romney, Paul Ryan, Republicans. Tags: Barack Obama, Deficit, Health Care, Mitt Romney, Paul Ryan, Republicans. RSS feed for comments on this post.. TrackBack URL.